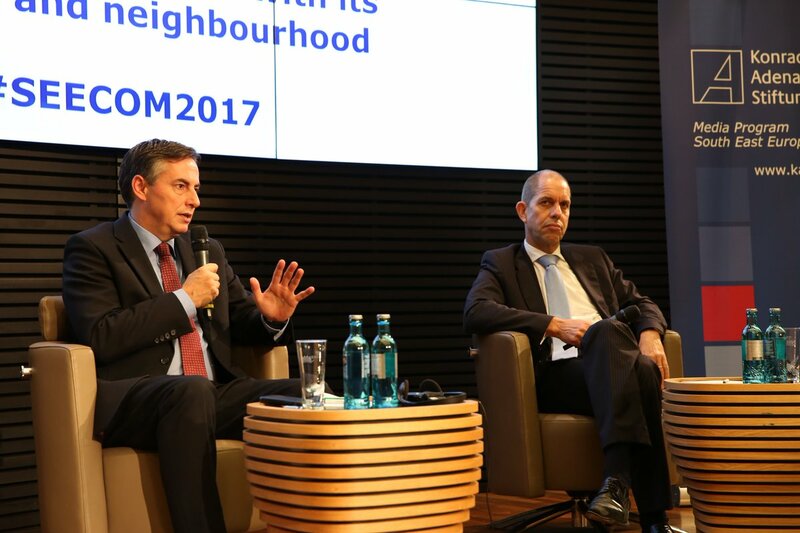 The SEECOM 2017 annual plenary conference entitled “Public Dialogue in Europe: Reconnecting the EU with its citizens and neighbourhood”, took place in Berlin on 13-14 October 2017. The event featured discussions between prominent public communication practitioners and experts from both sides of the Atlantic and senior officials from EU institutions, Member States and the EU enlargement countries, including among others MEP David McAllister, Deputy Secretary General of Konrad-Adenauer-Stiftung Dr. Gerhard Wahlers, Deputy Director-General at the European Commission’s DG NEAR Maciej Popowski, Montenegrin Minister of European Affairs Aleksandar Andrija Pejović, Serbian Minister of European Integration Jadranka Joksimović and Croatian Assistant Foreign Minister Boris Grigić. The participants addressed the questions of how to win popular support for EU enlargement in the Member States and the enlargement countries, how should a united Europe as a community of values stand up to propaganda and disinformation and the new campaigning trends and what they meant for governments. At the conference, the Konrad-Adenauer-Stiftung Media Program South East Europe presented a newly published book: “Reconnecting with citizens – from values to big data: Communication of governments, the EU and political parties in times of populism and filter bubbles”. 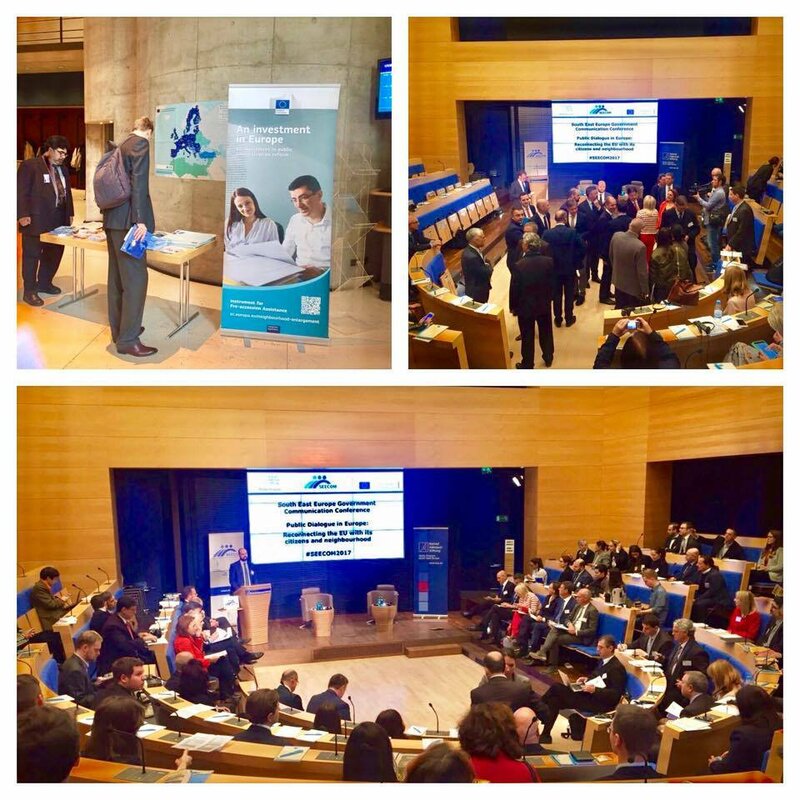 The event was co-hosted by the Konrad-Adenauer-Stiftung Media Program South East Europe and SEECOM, in partnership with European Commission’s DG NEAR. Although the European Union is by far the largest contributor of development assistance in South East Europe, the public perception in certain enlargement countries is that some third countries contribute more. Furthermore, the visibility and public credit that the European Union receives in the enlargement region is not in proportion to the volume of the EU’s investment. The level of public support for enlargement in the EU Member States remains disturbingly low, which highlights the pressing need for more coordinated action to explain to European citizens the importance of the EU enlargement policy, as a sustained effort to spread peace, prosperity and democracy throughout the European continent. In an increasingly challenging environment of disinformation, European governments are struggling to engage citizens in a dialogue on a united Europe. This challenge is also present in South East Europe, where third parties are working systematically to offer alternative narratives, values and perspectives to the citizens of the region. Although propaganda and disinformation existed before, the new geopolitical circumstances, the advance of information technology and the fundamentally changed media landscape have made those challenges much more impactful and much more difficult to discern. Regardless of the mounting evidence of the clear means and clear targets of the ongoing anti-European communications efforts, there doesn’t seem to be a common understanding in South East Europe, and Europe as a whole, of the presence, extent and perils of this new form of information warfare. The latest State of the Union Speech by President Juncker has provided a powerful boost to the enlargement process and the much needed encouragement for quicker reforms in the accession countries, offering for the first time in many years a timeframe for enlargement. With the recent election victories of pro-European forces in a number of key EU Member States, the mainstream of European politics is clearly shifting in favour of a common European future. This creates a favourable political environment to rekindle public enthusiasm for a united Europe through effective public communications. Reputation, credibility and public trust are pivotal for the ability of governments and public institutions to counter disinformation by effective communications. The reputation and credibility of the European project is best earned by showing the added value of the EU on the ground in local communities. 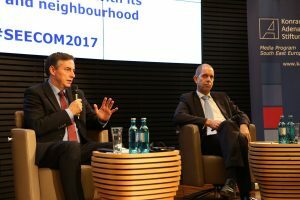 The very tangible benefits of the Berlin Process, as an effort to reconnect Europe’s South East with the rest of the continent, in terms of transport, energy and trade, as well as to boost regional ties, youth and civil society exchange, represents a major communication asset to this end. Although the pandemic problem of credibility of both traditional and new media and the surge of fake news and disinformation raises a serious communication challenge, it also represents an opportunity for governments to re-establish themselves as trusted sources of public information, especially through direct communication with citizens. This, however, requires adherence to the highest ethical and professional standards of government communications. There is no quick fix to anti-European propaganda, fake news or disinformation. Instead, sustained and coordinated actions by EU Member States, enlargement countries and EU institutions are required in order to build the resilience of European societies, through a combination of political messaging, engagement with local communities and civic education efforts. However, in order to reconnect the EU with its citizens and neighbourhood, political messaging at EU and national levels will not suffice. 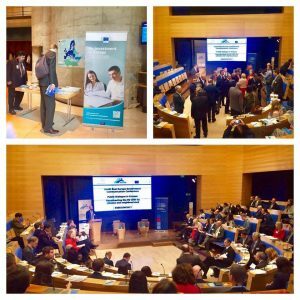 Instead, effective communication requires sustained dialogues at local level and active engagement with local communities, civil society and businesses in explaining how and why a united Europe matters. The focus of any strategic communications effort should be on people and the specific issues that they care about, rather than on institutional agendas, because people follow issues, not institutions. Opening a meaningful dialogue with a specific community on an EU-related issue that matters to them is a major step in making them care for and support the idea of a united Europe. Fostering professionalism and freedom of the media as a key partner for this dialogue is of paramount importance. Government communications should focus more on the added value, visible results and concrete benefits that a united Europe holds for citizens, to which end the Berlin Process offers extremely valuable assets. Furthermore, developing service-oriented communication which centres on the provision of useful and reliable information about public services and enables citizens’ feedback, serves to build public trust in government policies. Communications on Europe need to be able to capture people’s attention and engage them over specific issues. Involving citizens and communities more directly in the programming of the EU’s financial assistance to the enlargement countries would raise more public awareness and underscore the relevance of the EU integration process. In this context, integrating communications into the programming process for pre-accession financial assistance by the European Commission is highly commendable, as well as exploring options to increase governments’ capacity to communicate about the EU in the region.